Jamie Hamilton (right) with the late Malachi Mitchell-Thomas at the Mid Antrim 150 in April. 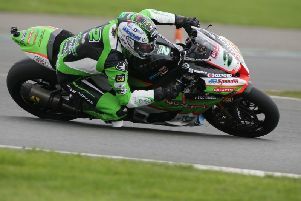 Jamie Hamilton says he accepts he may never know the exact cause of his life-threatening crash at the Isle of Man TT. Hamilton acknowledges that he was lucky to escape with his life in the incident in June last year, a realisation that was rammed home in tragic circumstances at the North West 200 in May, where young prospect Malachi Mitchell-Thomas was sadly killed. Hamilton remained within John Burrows’ Cookstown B.E. Racing team this year and was on hand to offer Irish roads debutant Mitchell-Thomas some advice at the Mid Antrim 150, Tandragee and Cookstown meetings before the Bolton rider’s untimely death in a crash during the Supertwins race at the North West. “I will never know what happened to me in the crash but I think I ran over the top of one of the white lines in the middle of the corner. I think they had been painted recently and I think there maybe was a bit of a lip on one,” Hamilton said. “I must have spun up on it and then when the bike gripped again, it did a big wheelie. I think I’ve shut the throttle off so fast that the front came down so hard that I fell off the side of the bike and it ran over my foot, and that’s what pulled me off the bike. Recapping his experience on the other side of the fence in 2016, Hamilton says he found it difficult playing a bit part role in Burrows’ team and reveals there were times when he even felt out of place. “It was hard this year and I wasn’t in a position to be fully involved with the team because of my health. I couldn’t push a bike to the grid or change a wheel and I was only able to offer a bit of advice to Malachi at the start of the season and show him around the tracks. “When Malachi died, it really took the edge off racing for me and I felt like I had no reason to be there any more. I was going to the races and standing in John Burrows’ awning wearing a team top and I almost felt a bit like a glory hunter. I don’t like that and I’d prefer to be able to get my hands dirty, but I couldn’t do that and it annoyed me,” he added. The fatal crash involving Mitchell-Thomas, which forced the abandonment of the North West, caused Hamilton to reassess his own circumstances and provided a stark reminder of his brush with death less than a year earlier. “As much as I was sad about what happened to Malachi, it really hammered home to me how lucky I was with my own crash. “If you had given me the option of crashing where I crashed at the TT, or crashing where Malachi crashed, I’d have taken the crash at the North West every day of the week,” he said.